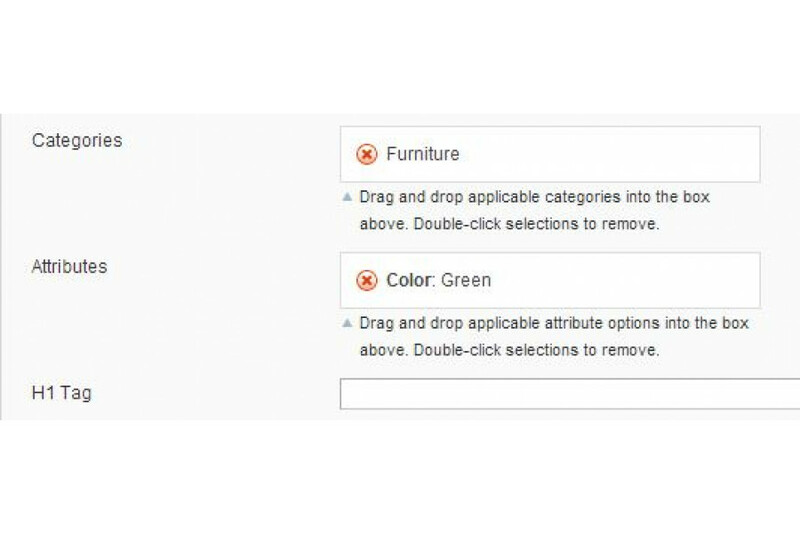 A Category Crosslink, also referred to as a Category / Attribute Crosslink is the solution to all of your Duplicate Content Issues for Category Pages! What is a Category Crosslink? 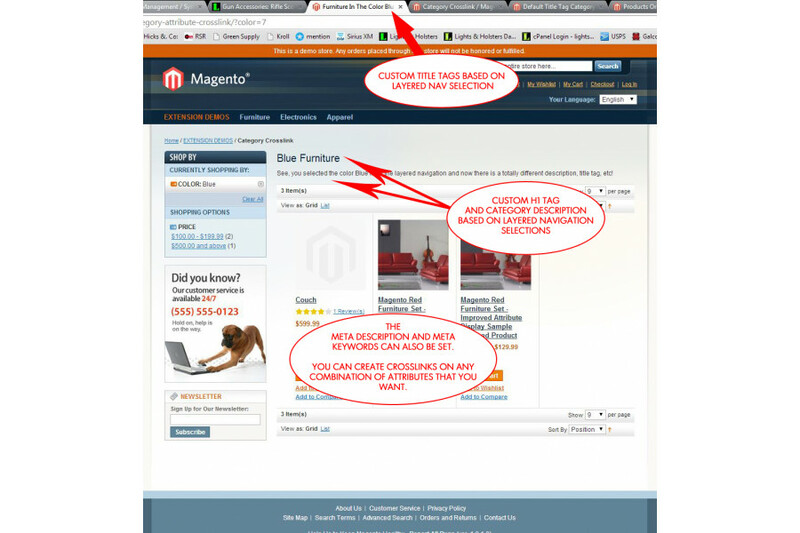 Why Is This Important To All Magento Sites? 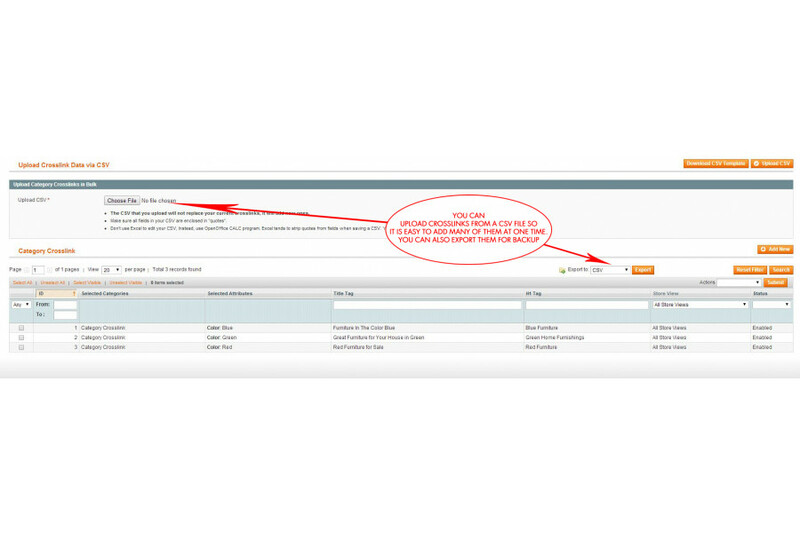 Each Category on your website typically has its own Description, Title Tag, H1 Tag, Meta Description, etc. When you use the Layered Navigation that typically appears in your category pages and you select an option, the URL of the page changes to reflect your selection but the Description, Title Tag, H1 Tag, and all the other stuff stays exactly the same. This is what Google sees as DUPLICATE CONTENT because Google sees two different URLs (one url before you select from the layered nav and a different one after you select from the layered nav) but the same general content appears on both pages. Why is this bad? For one thing, Google says so. For another, any SEO can tell you that duplicate content dilutes the importance of the content on the page and can confuse google. If you have two different URLs but both have the same Title Tag for example, such as Clothing for Puppies, Google will be confused as to which page is more important and which one to point a potential shopper to. This will likely hurt your search engine results and these pages with duplicate content will show up in Google Webmaster Tools as needing to be fixed. 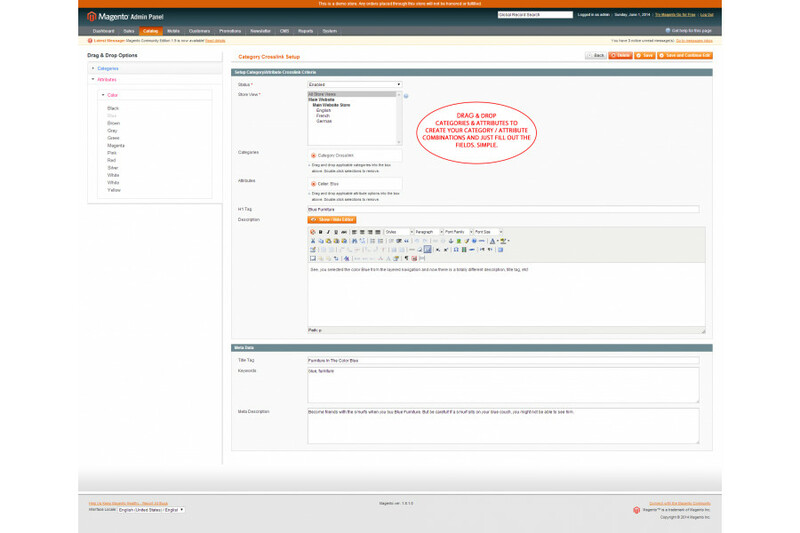 In the admin section of your site, you select a Category and Attribute Combination(you can select as many attributes as you want) as shown in this image. In this example, we have chosen the Category: Furniture and the Color: Green for which to activate the Crosslink. Description: At this really cool furniture store, we really have a passion for couches and chairs. They are so comfortable. Browse our selection below. Meta Description: Get Free Delivery on your favorite Home Furnitue when you shop with Really Cool Furniture Store! Description: If you thought only the Incredible Hulk liked green couches and chairs, you were wrong! Leprechauns and Goblins like green furniture too. Browse our selection of green couches and chairs below. Meta Description: Shop for Green Furniture at the lowest prices with Free Delivery only at Really Cool Furniture Store! A rather simple example above, but now we just told Google where to look for Furniture in general and where to find Furniture specifically in green. We have essentially created a new, unique page.